Brighten up your beauty regime with a vanity mirror that ticks all the boxes. Every makeup lover’s dream, this trifold mirror is an absolute essential. With Adjustable Illumination, whether you’re applying makeup, styling your hair, or indulging in some skincare – you can easily find the right light setting. Lightweight Foldable Design with 180° Vertical Rotation – find the right angle for contouring, strobing and blending. 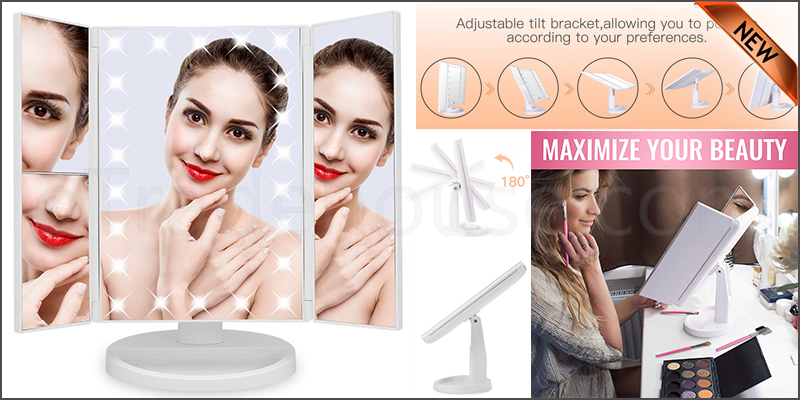 The mirror is totally portable when battery-operated, so you can use it in the bathroom, on the dresser or wherever you prefer to do your makeup. It’s small size and lightweight feel make it the perfect gift for the makeup lover who’s always on-the-go – simply fold it up and pack it away for easy transportation.